Playing blackjack for real money online is not something to be taken lightly. Gambling in general is risky business. The reason why Las Vegas is able to build new multi-billion-dollar casinos every few years is that the house advantage always pays off for the house. The same with any casino, live or online. If someone is looking at blackjack as a way to earn an income, we urge you to reconsider. However, gambling can certainly be fun and exciting, and you never know when you'll go on a lucky streak. Just be aware of the inner workings of any casino before you attempt to play for real money online. 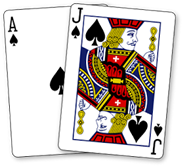 Here are a couple of quick blurbs to help you navigate a real money online blackjack casino. 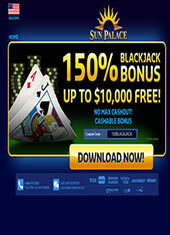 Operated out of Panama City, Panama, Sun Palace Casino offers newcomers a 150% deposit bonus up to $10,000. What this means is that putting $100 into your account will be met by the site with $150, up until reaching 10k. The casino offers seven types of blackjack, game variations as of this writing, and a strong, stable and reliable gaming software platform that delivers the optimal blackjack gambling environment for free play or real money play. They accept US players and are among the most trusted brands throughout the online gambling community. 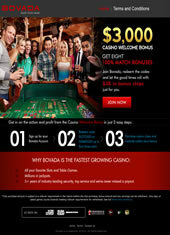 A large casino that offers poker, basic table games, slots, and even a sportsbook and poker room, Bovada Casino claims to offer one of the most lucrative welcoming bonuses. This particular bonus is a 100% deposit match, up to 8 separate times, for up to $3,000, and includes blackjack as an eligible game in meeting wagering requirements for their welcome bonus. This particular casino offers multiple types of blackjack, including Traditional, Single Deck, Double Deck, Zappit and European, among others. Bovada is the number one US friendly blackjack site, and offers both real money gambling and free play options for their top rated casino. Lucky Red has been operating out of the UK since 2004, and they provide new players with a 400% deposit bonus, good for playing slots, and a 100% match bonus up to $1000 for playing blackjack. In terms of their blackjack offerings, they offer six separate types: Traditional, Perfect Pairs, Euro, Pontoon, Match-Play, and Face-Up. Pontoon offers better odds on player wins, while match-play pays off huge if you match trip 7s to hit 21 (40:1), and face-up allows you to see both dealer cards. Club USA, despite its name, is actually operated out of the UK. 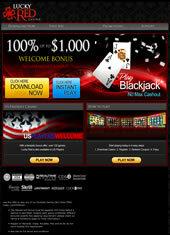 Club USA offers a blackjack specific bonus of 100% up to $150. Alternatively players can receive up to $777 in a deposit match bonus to play other casino games. Club USA does have six types of blackjack: Traditional, Perfect Pairs, Face-Up, Match-Play, Pontoon, and Super 21. The only type we haven't discussed yet is Super 21, and this is basically a traditional game that pays out differently depending on how you make 21. The rules are still the same, and the gameplay is the same. Wherever you end up playing your real money blackjack, make sure you research the casino. Again, these are not casino promotions. If you are interested in seeing what they offer, go to the sites, read about their policies, and make an informed decision. We simply seek to provide you with resource information to help you better understand blackjack, where to play it, how to bet, and how to stay safe while playing. One of the first things to focus on is the deposit structure of the casino. First and foremost, make sure you live in a territory that is accepted by the casino. Next, look at their different options. You will often find options such as MasterCard/Visa, Neteller, money transfers (bank, wire, etc), and even services like Western Union. However, figuring out how to get your money in is only half the battle. How about getting money out? Withdrawing your funds is of equal concern. Few casinos are going to send money to PayPal or refill your debit. You will have to look into options such as bank transfers and paper checks. Make sure you are very comfortable with the withdrawal structure before proceeding. Another aspect of real money online blackjack to focus on are the different limits set. Limits, in this context, has two distinct meanings. The first, of course, is the table/game limit. When you get into a game, understand how much you can bet, how much you will have to bring with you, and the maximum total bet allowed. You do not want to get into a game where the limits are too high for your budget. The second limit here is the personal limit you set for yourself. You should budget your bankroll wisely to ensure that you're not simply chasing bad beats. Give yourself a limit and stick with it. The depositing methods are simple once you find out the right method, and signing up for and downloading casino software should be self explanatory. What you need to exercise is caution. Take ample time to study the monetary features of a real money casino before you play. Check out our list of quality sites where you can play free online blackjack or if you prefer to play while on the go, check out our list of mobile blackjack sites.